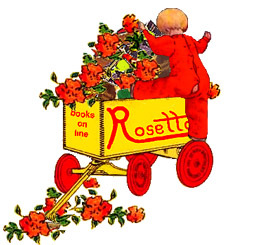 Donating to Children's Books Online: the Rosetta Project, Inc.
People or organizations donating books to our collections may be able to deduct some or all of the market value of their books or collections donated to this project. Therefore, we strongly advise contributors to have their collections professionally appraised before sending us collections of significant value, if they intend to itemize these donations. Currently we are accepting scanned copies of books which were published on or before 1930. We accept original scans taken at 220 dpi and saved as psd (Photoshop) format. Please remember to carefully number each scan in order, as we do not have a book to check our work against, and often children's books are not paginated. We accept scanned book donations sent to us on CD ROM, or call Guy Chocensky (207) 548-0960 to make arrangements to FTP the works directly to us. Rosetta Project is committed to having all our works translated into as many languages as possible -- even "dead" languages such as Latin, or "international languages" such as Esperanto or Yiddish. If humankind spoke it once, speaks it now, or plans on speaking it in the future, we're interesting in having that language represented in this collection. No Fooling! Donating a translation simply requires that you clearly note the books which has been translated, and once again, we ask you to remember that we must be certain which page is translated so that we do not get the order of pages confused. Translations can be submitted by e-mail. Please include your name, address and an e-mail address where we can contact you should there be any confusion about the translation. We are always happy to keep book or monetary donators names' anonymous if that is their wish. We are also very pleased when our donators and volunteers prefer not to hide their light under a basket. We believe that contributors deserve recognition for their charitable gifts and works to this noble project. We are a volunteers' organization in service to humankind and we think our volunteers are very special people. When making donations please indicate if you will allow us to recognize your contributions on our Volunteers and Benefactors pages.